I love sweet potatoes! YUM! 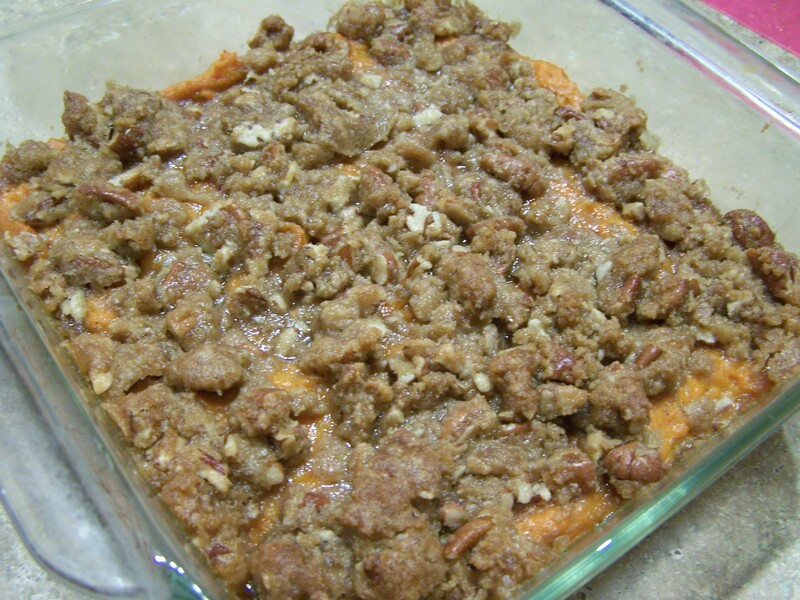 And, no…not the kind from a can with mini marshmallows on top…yuck.. Real sweet potatoes with a delicious pecan topping. Perfect for Thanksgiving. This is adapted from a recipe from Food Network. For Thanksgiving I make a double batch of this and put it in a 9X13 inch baking dish. When I make this for Thanksgiving, I prepare it the night before without the topping on it. When it’s almost time to eat, just sprinkle on the topping and throw it in the oven. Preheat oven to 400°F. Poke the sweet potatoes several times with a fork and bake until very tender, about 45 minutes. Scoop out the sweet potato flesh and discard the skins. Mash with a potato masher until smooth. Whisk in the eggs, butter, brown sugar, salt, cinnamon, ginger, nutmeg and pepper. Butter an 8X8 inch casserole dish and pour in the sweet potato mixture. For the topping, mix together the pecans, flour, brown sugar and butter. Sprinkle on top of the sweet potatoes in the casserole dish.